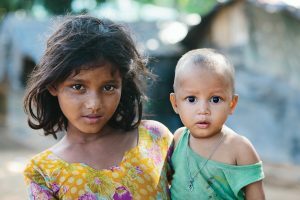 November 2017, Kutupalong Refugee Camp, Cox’s Bazar, Bangladesh. A young Rohingya refugee girl tends to a baby in a place with no amenities and a difficult, uncertain future. Photo by Shannon Ashton. 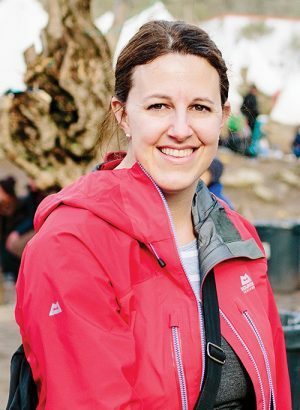 For Shannon Monroe Ashton (BS ’98), the most significant part of her BYU undergraduate journey was not obtaining a psychology degree but having a study-abroad experience in France. It was there she discovered her passion for exploration and appreciation of other cultures. In 2008 Ashton moved with her young family of five to London, where she has since turned her love of photography into a portraiture business as well as a service opportunity, documenting the lives of the growing number of displaced persons in the world. Shannon Ashton. Photo courtesy of Shannon Ashton. Ashton took the images printed here at camps in Bangladesh, at the Syrian border, and in Greece, working with the humanitarian organization Lifting Hands International. November 2017, Kutupalong Refu- gee Camp, Cox’s Bazar, Bangladesh. 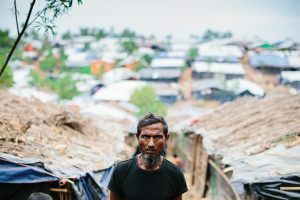 A Rohingya man stands amid a vast squalid camp holding tens of thou- sands of refugees after surviving horrific reprisals at the hands of Myanmar’s military. Photo by Shannon Ashton. March 2017, Mafraq Governorate, Jordan (less than a kilometer from the Syrian border). 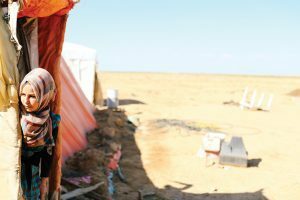 A Syrian woman lives on the edge of survival in an isolated refugee camp with her ravaged home country of Syria visible in the distance behind her. Photo by Shannon Ashton. January 2016, Moria Camp, Lesvos, Greece. 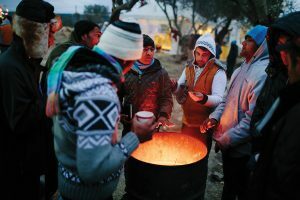 Having survived the harrowing journey from Turkey to Greece by raft, Afghan refugees huddle for warmth in the bitter, damp cold of winter, waiting for days for identification documents from Greek officials. Photo by Shannon Ashton. Tom V. Huynh met the missionaries in a refugee camp. He's since served a mission, graduated and is on the Town Council. These BYU grads boarded a ship for the Caribbean, but it was no cruise. They were there to help and offer medical aid.